We’ll be stopping by starting the week after next with the new area directories fresh off the press. 🙂 Looking forward to seeing you in person then, and at some of the upcoming meetings and events listed below. Send information about Earth Day events to Coach Weber by MONDAY the 11th! In conjunction with Earth Day we’re working with community partners to host another week-long celebration. We’ll have neighborhood clean-ups, an art crawl, and more! 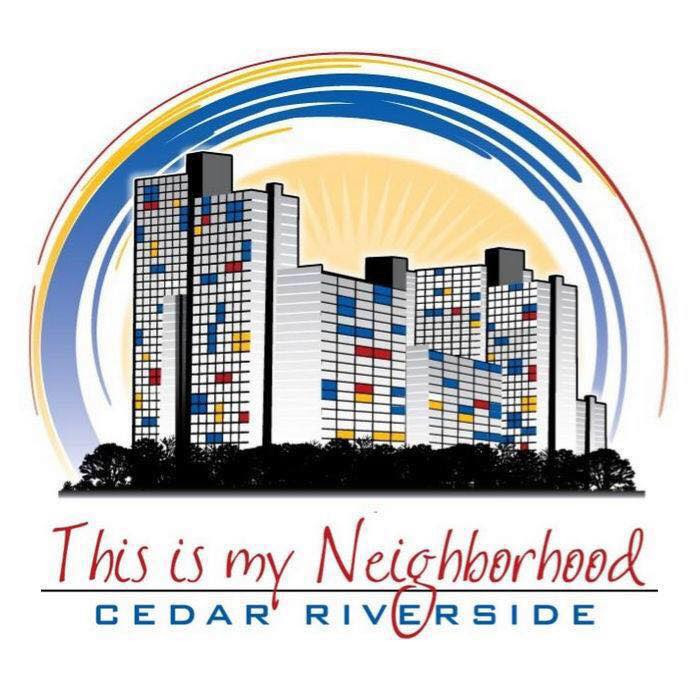 The week will culminate with an neighborhood crawl Art Crawl on Saturday afternoon leading into the Cedar Cultural’s Center Plaza grand opening celebration. Plastic bags, bottles and cigarette butts – oh my! Help us celebrate Earth Day and ring in spring as we spruce up our West Bank Neighborhood! We’ll be meeting Friday April 22nd at Edna’s Park (the area next to the Wienery) for a neighborhood-wide cleanup. 12pm-3pm. Last year we met to talk about how we can work together more as we shape the long-term vision for our neighborhood. We continue to build on that work and take an engaged path in shaping the future of the West Bank. 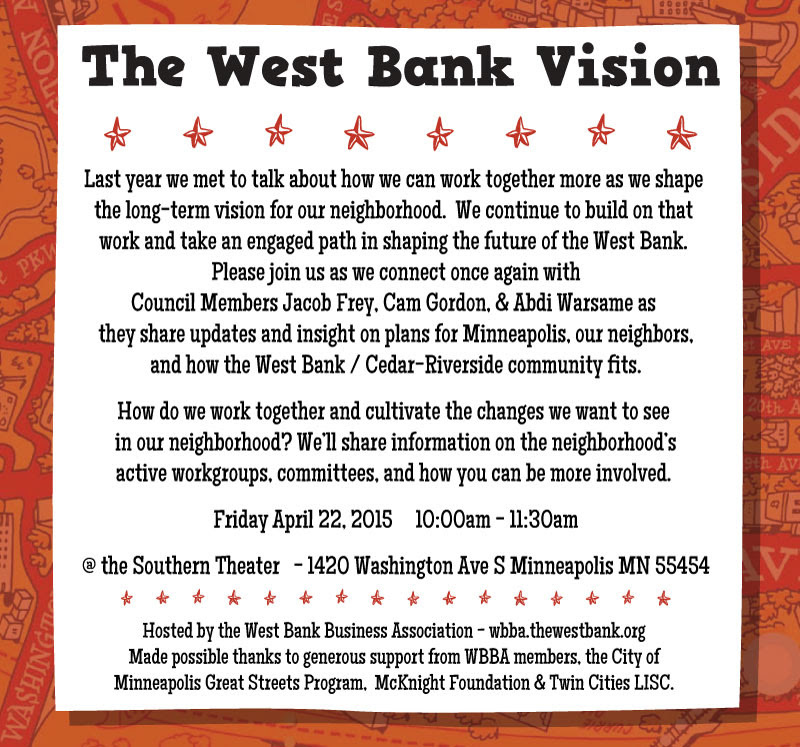 Please join us as we connect once again with Council Members Jacob Frey, Cam Gordon, & Abdi Warsame as they share updates and insight on plans for Minneapolis, our neighbors, and how the West Bank / Cedar-Riverside community fits. How do we work together and cultivate the changes we want to see in our neighborhood? We’ll share information on the neighborhood’s active workgroups, committees, and how you can be more involved. We’ll be meeting at The Southern Theater, 1420 Washington Ave S, Minneapolis, Minnesota 55454 on Friday April 22, 10:00am-11:30am. Bicycle Benefits is a nationwide program that encourages bicyclists to ride to local businesses by offering them discounts or promotions at those businesses. Riders buy a sticker to put on their helmets, and just show the sticker when buying something at the local business. Being a business partner for Bicycle Benefits is easy. Just choose a benefit (for example, 5% off your purchase, or 50 cents off a coffee), and let us know! We’ll send you a sticker for your window, and add you to the Bicycle Benefits website. It’s as easy as that! If you’d like to sell Bicycle Benefits helmet stickers, you can order them online here. Bicycle Benefits Twin Cities is managed by the Minneapolis Bicycle Coalition. 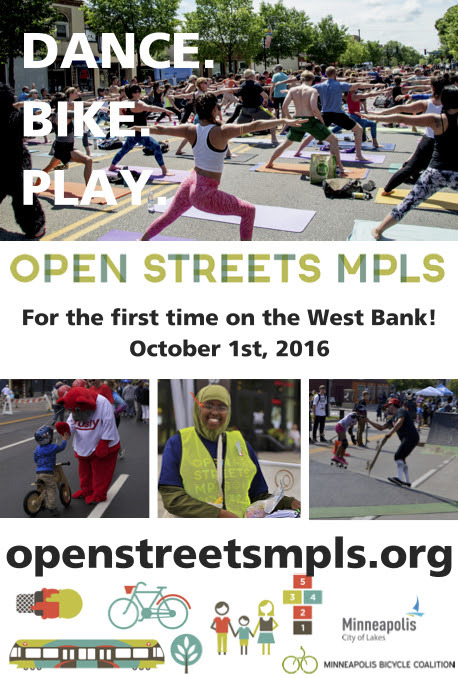 If you have any questions on being a part of Bicycle Benefits, please contact Alex at alex@mplsbike.org. 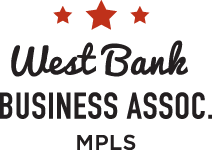 Learn more about the program and see what other businesses have signed up at www.bicyclebenefits.org, and select the Twin Cities.